The output of the action that was called has statusCode: 401. The Azure Function that's being called does not have any written code that returns that statusCode. After redeploying the Logic App the issue was gone. Does anyone know what can cause such error? Maybe the Logic App somehow has problems with authenticating to the Azure Function? 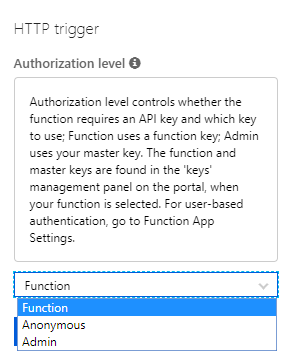 Could this be related to Azure Functions keys (for example if they changed)? I'd try to check the Authorization level in the Azure Function. Maybe you Authorization level has changed and now you must indicate the code/token in order to call it. Not the answer you're looking for? Browse other questions tagged azure azure-functions azure-logic-apps http-status-code-401 or ask your own question. Logic App limits and configuration - How to configure the Logic App action Run duration? Does (Azure Logic Apps) Webhook support managed identities based authentication?